Those people forecasting the mall’s demise may have felt their pessimism confirmed by last week’s news that the ubiquitous mall chain Claire’s is fighting off bankruptcy (a decline marketers have been watching for over a year). Claire’s decline may indeed confirm malls’ fundamental design liabilities and reflect broad economic and demographic shifts, but our fascination with the declining mall almost certainly risks pronouncing their death sentence too soon. While shifts in consumption and settlement patterns have transformed the contemporary shopping landscape for malls, our sheer boredom with the homogeneity and predictability of malls may be more dangerous to their survival than factors such as our attraction to online shopping or the decline of department stores. 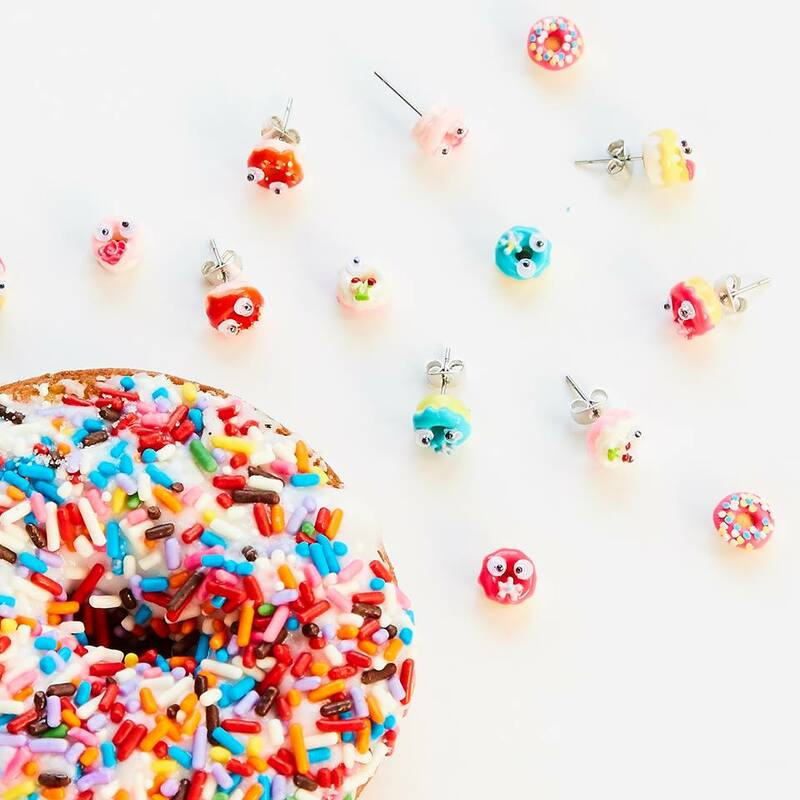 For those wishing to celebrate doughnuts, Claire’s offers these doughnut earrings. Claire’s is part of a pantheon of stores that seem installed in nearly every American mall. Last week The Cut described Claire’s as a “beloved tween haven of body glitter and best-friends-forever jewelry,” and Claire’s suggests that it offers the young female consumer “innovative, fun and affordable products and services that cater to all of her activities, as she grows up, whenever and wherever.” From nearly 3000 stores in about 95% of American malls Claire’s hawks novel things like BFF bracelets, pink flamingo earrings, and daisy necklaces to “young women, teens, tweens, and kids.” More ears have been pierced at Claire’s than at any other American retailer, and while its American image is of an inexpensive “treasure hunt” mall shop, the chain has stores in Paris, the Ukraine, and China and an Icing brand that takes aim on the 18-35 year-old woman. 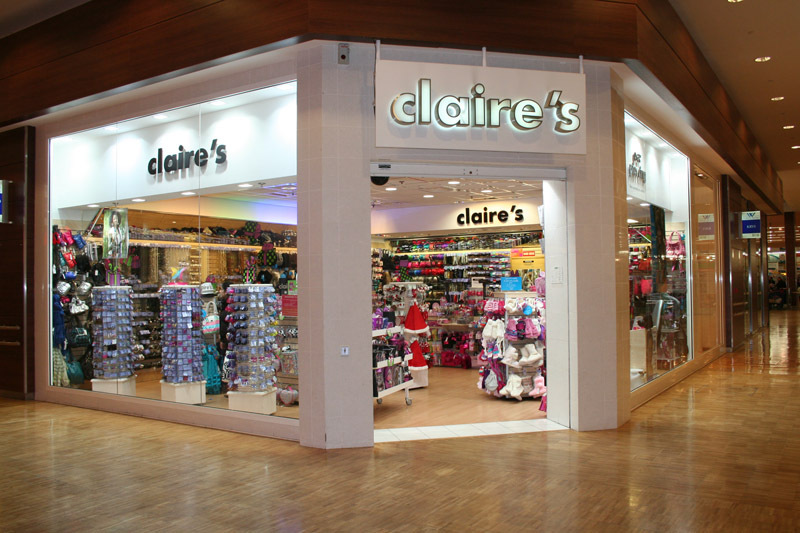 Claire’s decline follows the demise of many other retailers who tied their fates to shopping malls. The cemetery of mall chains includes men’s clothier Chess King (1968-1995), Thom McAn shoe stores (introduced in 1922, the brand is now sold only at Sears), B. Dalton booksellers (1966-2010), Sam Goody’s (nearly all converted to f.y.e. stores in 2008), and working-class women’s clothier Casual Corner (1950-2005). Other brands or chains have survived, some dramatically transformed and others on a more modest scale: for instance, novelty merchandiser Spencer’s Gifts continues to peddle black light posters, crude gag gifts, and “irreverent” things in more than 650 US stores; since 1987, Orange Julius’s legendary powdered egg drinks have been sold by Dairy Queen; and teen apparel retailer Aeropostale filed for bankruptcy last month. Once viewed as mesmerizing places of material plenty and deeply embedded in our collective imagination, dying or emptied malls now dot much of an American suburban periphery glutted with retail space. On the one hand, consumers entertain a romanticized nostalgia for malls and particular chains, especially those that have now disappeared. This may not diverge from much of the popular fascination with ruins, though the anxiety inspired by dying malls is perhaps more unsettling than the corpses of now-emptied malls. On the other hand, though, nearly none of that nostalgia focuses on material things. Many of the voices memorializing malls simply wax nostalgic for their youth, rarely invoking the actual material things in malls or even the malls themselves: that is, a very modest amount of the popular commentary on malls’ demise laments the loss of commodities like Chess King jackets, and few people seem to hope that fountains, vinyl plants, and the unmistakable odor of Sbarro’s will become the standard for consumer design. Instead, most people at the regional mall’s wake focus on the social experience of mall shopping itself. This may suggest that malls’ zenith was not especially firmly tied to commodities, but was instead a staging ground for the shopping experience itself. A sample of Claire’s broad sampling of glitter products. This probably comes as bad news for Claire’s, whose appeal revolves around novelty: Claire’s provides a host of unexpected or singular things that somehow capture a consumer’s idiosyncratic imagination. Claire’s relies on shoppers actually coming to the mall in the first place, and if shoppers have indeed become bored with the mall shopping experience they will never be beguiled by a unicorn rainbow trinket box. Many mall stores rely on a similar appeal to novelty to spur purchase: for instance, Yankee Candle simply hopes to capture our unexpected fascination with the odor of magical frosted forest; Spencer’s aspires to convince us that a gag gift will be a fine gift for a buddy; and Brookstone gambles that we will be enticed by a neck and shoulder sport massager. Like most shopping spaces, malls fundamentally “work” when they encourage imagination, and malls intensify that introspective day-dreaming by fostering experiences more like an amusement park than a Wal-Mart. Perhaps the greater failure of the enclosed mall is that it has abandoned almost all pretense to being civic space that reaches beyond shopping alone. Much of the promise that planners once placed in malls as walkable civic spaces integrated with surrounding communities has instead resulted in private patrolled fortresses ringed by oceans of parking. 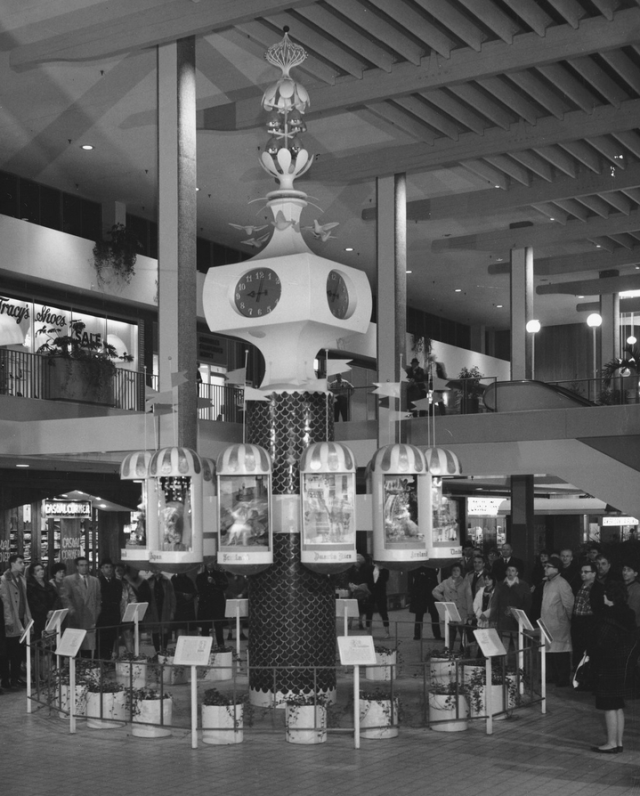 Victor Gruen planned perhaps the country’s first mall, the 1956 Southdale Center in Edina, Minnesota, which he imagined to be a mixed used civic space that included shopping as simply one dimension of community life. However, Gruen eventually was dismayed to realize that enclosed malls did not become broadly based walkable communities. Despite all the gloom for the conventional regional mall, perceptions that the mall is inevitably dying are probably premature. In 2015 one report observed that about 80% of America’s malls were considered “healthy” (that is, with a vacancy rate less than 10%). However, Kenneth Jackson was probably correct in his instinct that the interchangeable regional mall–held down by the likes of Victoria’s Secret and Yankee Candle, engulfed by a jarring asphalt expanse of parking lots, and bearing only the slightest pretense to being a social space beyond consumption–may be on its last legs. 1993 The “Magic of the Mall”: An Analysis of Form, Function, and Meaning in the Contemporary Retail Built Environment. Annals of the Association of American Geographers 83(1):18-47. 1960 Shopping towns USA: the planning of shopping centers. Reinhold Publishing, New York. 1996 All the World’s a Mall: Reflections on the Social and Economic Consequences of the American Shopping Center. The American Historical Review 101(4):1111-1121. 1998 City center to regional mall: architecture, the automobile, and retailing in Los Angeles, 1920-1950. MIT Press, Boston, Massachusetts. 2013 Pedestrian Modern: Shopping and American Architecture, 1925–1956. University of Minnesota Press, Minneapolis. 2005 Call of the Mall: The Geography of Shopping by the Author of Why We Buy. Simon and Schuster, New York. Posted on June 3, 2016, in Uncategorized and tagged Claire's, Malls, shopping, Victor Gruen. Bookmark the permalink. 6 Comments. As one who does most of his shopping on-line, I don’t perceive a bright future for shopping malls. I consider them crowded, unnatural environments. There are still some things, like suits or musical instruments, that you have to try out or on in the store, so malls may survive in reduced form. Retail chains such as Walmart might have more of an advantage, but what I would hope to see is the return of more small, privately owned stores. My guess is that a more-or-less enclosed shopping space–slightly mall-ish, but not married to cars, restricted to consumption venues alone, or peopled with a bunch of predictable chains–probably has a future in some places, but it can thrive alongside small creative shops, big box retailers, and online shopping. My instinct is that malls somehow need to become more firmly civic spaces instead of security-patrolled concrete boxes, and there are some interesting examples of places going in that direction. Changing times, and of course there have been a number of interesting attempts to change individual mall environments, by radically overhauling the architecture and the public space aspect of the original malls and experimenting with the tenant mix. Leasing these spaces and the theory of tenant mixes began in days when successful retailers from in town department stores and other well established shops were the companies to lure because they had established consumer loyalty, and these stores anchored malls which then fostered a new sort of retail ecology. Several factors meant that larger companies able to take advantage of this new kind of environment thrived there for a while. The little places like Claires found a niche and grew. Now the environment, as you note, is radically changed by shifting consumer patters as well as by a changing reaction to some of the problems that developed with the malls. It is a great area to explore for archaeologists of the modern, but jumping straight from the early Gruen and Smith manifesto to some of the contemporary fallout is like ignoring most of the stratigraphy of a site. As an anthropologist. folklorist with archaeological background, now a filmmaker, I am particularly intrigued by your enquiry into Gruen and Smith’s ideas because a number of people in my family, (including me) worked for the successor to Smith’s company, and I can remember being in and out of Gruen’s offices as a kid, being shown drawings and hearing some of the ideas under discussion. I moved away from this world pretty rapidly in my own career, but I watched it from the sidelines because of continued family involvement and I would suggest that looking further at what happened to a few key developers and the successor companies and the specific malls they were involved in etc. would provide a really useful way to get further into this world. Few of the people involved in the original visioning are around now, but quite a few people who had direct exposure to their ideas are. These days it is far from my own usual focus as an ethnographic and archaeological filmmaker, but I have been working on a film project for a few years that takes me regularly past one of the early malls my grandfather and father were involved in, and I have watched the downward spiral of several of the malls in that area (San Diego) with some interest and have a view as someone who does not use malls much in 2016, but grew up around their development and was aware of the dreams and ideals as well as some of the details of how those gradually crumbled. Thanks for the really interesting thoughts and story. There is some good scholarship on Gruen, and his firm had a significant impression on lots of US communities. Gruen and his firm did some really interesting work here in Indianapolis linked to urban renewal projects in the late 1950s, and he directed the construction of the city’s first real mall, Glendale, which began as an outdoor mall, was later enclosed, and is now an outdoor walking mall again. There’s some good scholarship being done on malls and lots of potential to do more work.